The Gateway Trail is a 10 mile multi-use cross country trail network with constant elevation changes, flowing turns, and short sections of steep descents or climbs. The trail starts at 3,943 feet and climbs to a highpoint of 4,375 feet. Despite only a 450 foot difference in elevation between the trailhead and maximum elevation, riders will be physically challenged by constant rollers, steep bursts, and never ending turns. The trail—located entirely on Forest Service land—winds through a ponderosa pine forest and provides spectacular views of Mount Shasta, Mount Eddy, and Black Butte. Trails are well marked and the many forest service roads in the area provide alternate routes. Option: After a hard cobbled rock section at the end of the trail, look to your left for a road on the other side of the river. If you walk or wade across you can follow that road back to North Shore Road (on the northeast side of Lake Siskiyou). 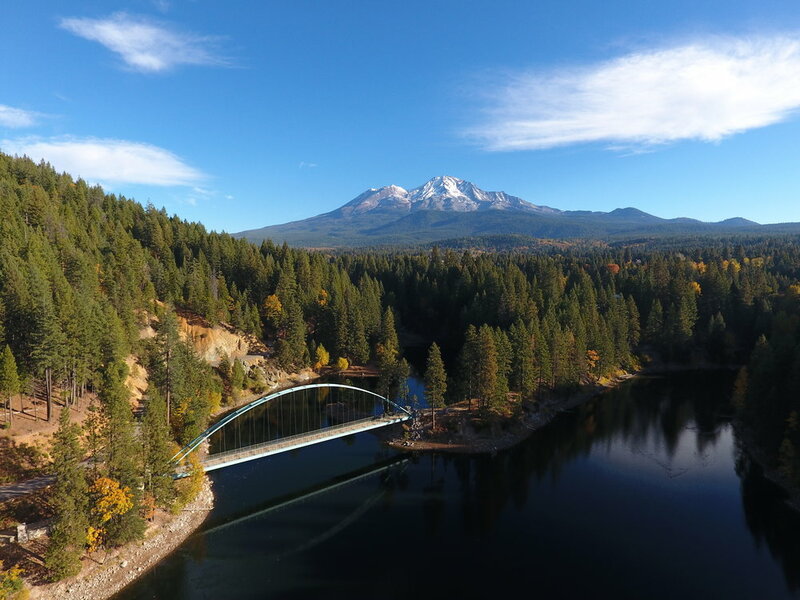 This multi-use trail system crosses three bridges to circumnavigate beautiful Lake Siskiyou with views of the lake, Mount Shasta, and surrounding mountains. The trail alternates between shady forested areas and open, expansive views of the lake. Alternate routes off the main trail allow riders to follow the shoreline in some areas on a single track. The two pontoon bridges at the north end of the lake are in place from mid-May to mid-November. At other times of the year, the distance one way on the north shore to the delta is 2.2 miles and the distance following the southwest shoreline is 4.4 miles to the delta. The trail is a mix of dirt hard pack, pine needles, and gravel with some short paved sections. Riders can travel in either direction from several parking areas. Dismount to traverse gravel and cross bridges. The trail is marked but can become confusing through the campground area where there are several intersecting trail systems. Some riders use the road to bypass the beach and campground areas and rejoin the trail at the marina. Outhouses, restrooms, a seasonal snack bar, restaurant, and store can be found along the route. Gateway Trail Phase 2 will add over 40 miles of accessible, sustainable, multi-use recreational trails to the Shasta-Trinity National Forest. This project will connect the Mount Shasta Ski Park and the Mount Shasta Nordic Center with the city of Mount Shasta and McBride Springs Campground, and establish three new trailheads for public access. The project will also link to existing federal national forest trails and the Great Shasta Rail Trail. Development of these trails has been a long time coming and finally in 2017, Bike Shasta and the Mount Shasta Trail Association secured $420,000 from the McConnell Foundation for project implementation. Federal permitting and design is expected to be completed by late summer of 2018 and construction is scheduled for Spring 2019.